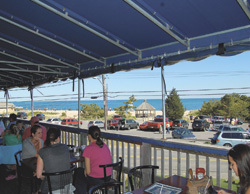 Established in 1936 and overlooking Nantucket Sound, The Skipper Restaurant and Chowder House is one of Cape Cod’s oldest waterfront restaurants. Our crew has made The Skipper the success it is by hard work and taking care of our locals—whether you’re a local for a day, a week or a lifetime. We prepare from scratch only the finest, freshest seafood, Angus cuts of beef and our award-winning clam chowder. For a true sense of Olde Cape Cod, don’t skip The Skipper...and don’t miss a visit to our Ice Cream Shack. of Cape Cod, Boston & Newport Chowderfests! Directions: From Rte 28, turn onto Seaview Avenue to end, left on South Shore Drive, The Skipper is on left, facing the beach. (“KO-HOG”) A large native clam. salad with green leaf lettuce.